MONTREAL — Things have changed. They always do. Since our last roster projection, bullpen arms have gone down in a hurry, conspiring to leave the Toronto Blue Jays scrambling to cobble together the back end of the roster heading into Thursday’s season opener. Luckily, however, most of the key names are healthy, including the one-two punch atop the rotation in Marcus Stroman and Aaron Sanchez, while Vladimir Guerrero Jr. is on the mend in the minors from an oblique injury. With two games against the Milwaukee Brewers in Montreal providing one final chance to impress, here’s a look at what the opening day roster could look like. 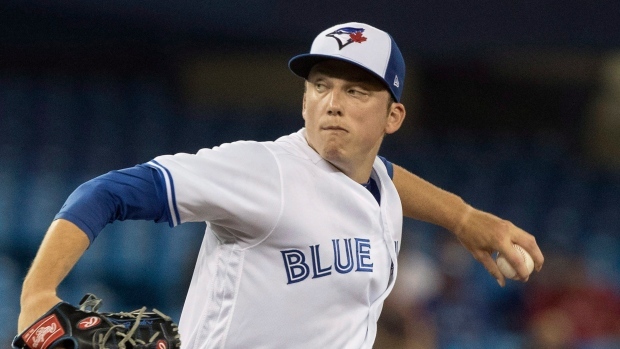 What’s changed: Ryan Borucki’s elbow is barking. How it could change again: Borucki’s only expected to miss one start, while Clay Buchholz made his spring debut and is expected to be ready in mid to late April. The top four are unchanged but Borucki will miss at least one start after experiencing elbow discomfort. The Jays are optimistic he’ll return shortly. Manager Charlie Montoyo mentioned Sean Reid-Foley, Trent Thornton, Thomas Pannone and Gaviglio as options to fill in. If Borucki quickly gets past his elbow issue and Buchholz is able to ramp up by mid-April, Richard could find himself in the bullpen. What’s changed: Ryan Tepera and John Axford went down with elbow injuries, while veteran right-hander Daniel Hudson was signed to provide much-needed depth. How it could change again: David Phelps will return to a high-leverage role at some point, but the jury is out on when Tepera and Axford will be ready. The bullpen has taken hit after hit as spring training finished up, forcing the Jays to go out and sign Hudson, who posted a 4.11 ERA in 46 innings with the Dodgers last year but was released last week by the Angels. Right now, Giles, Mayza, Biagini, Norris and Hudson are the only names locked in, and after that it’s pick your poison. The Jays would love to keep Pannone and Trent Thornton stretched out as starters in Triple-A, but they may have to shift to the bullpen out of necessity as they’re already on the 40-man roster and choosing other options would force even more of a roster shuffle. Hoping to have their roster finalized by the time they arrived in La Belle Province, the Jays will now take the decisions down to the wire, including trying to decide whether or not to keep 19-year-old Rule 5 draft pick Elvis Luciano, who either needs to make the team or be offered back to the Kansas City Royals. Luciano has posted an 11.42 ERA this spring, but the fastball has life and there are glimpses of a major-league arm. Others in the running include the recently acquired Adam, Danny Barnes, Javy Guerra, and Justin Shafer, all of whom would have to be added to the 40-man roster, further complicating the situation. In a bit of good news, Tepera emerged from Saturday’s visit with Dr. David Altchek not needing Tommy John surgery, and the right-hander is expected to ramp back up once his elbow inflammation subsides. 5. 2B Lourdes Gurriel Jr.
What’s changed: Not a whole lot. How it could change again: Vladdy Jr. is looming. Not much has changed this spring when it comes to the position player group that the Jays will be taking north. The lineup you see above will probably include Kendrys Morales on most days, but that could change if both sides of the Hernandez/McKinney outfield platoon are productive out of the gate. Devon Travis’ injury opens the door for Gurriel to see extensive time at second base, but that will change once Vladdy Jr. arrives and shoves Drury into a super-utility role, with most of that time likely coming at the keystone. What’s changed: Urena locks down extra infielder role. How it could change again: Urena’s roster spot will be in jeopardy once Vladdy Jr. is called up, but that could be weeks away. As expected, Reese McGuire was demoted, leaving Jansen and Maile as the two catchers breaking camp. Urena, thanks to being 23 and already on the 40-man roster, should win the battle with 32-year-old Eric Sogard to be the extra infielder, while injuries to Jonathan Davis and Dalton Pompey essentially ruled out the remote possibility of the Jays breaking camp with five outfielders. It won’t be a deep bench, but the bullpen is the priority right now, so the Jays will go with eight arms instead of seven.